Students recite the Oath of an Occupational Therapist. 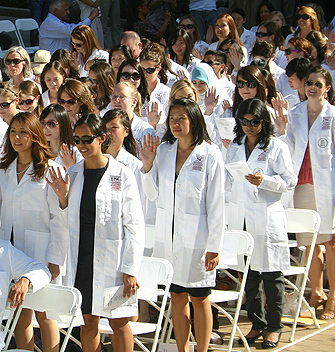 The Division of Occupational Science and Occupational Therapy hosted its inaugural White Coat Ceremony at the Pappas Quad on USC’s Health Science campus on Aug. 26. In front of faculty, administrators, family and friends, more than 200 occupational therapy graduate students donned their new white coats, a traditional symbol of professional responsibilities in health care. 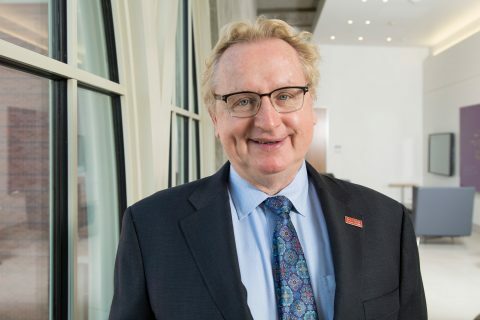 Because occupational science and occupational therapy is a division of the Herman Ostrow School of Dentistry of USC, Dean Avishai Sadan offered the keynote address. He congratulated the students and challenged them to fulfill the expectations that come with being an occupational therapist at the university. Thanks to its success, the division plans to conduct a White Coat Ceremony at the start of each academic year.